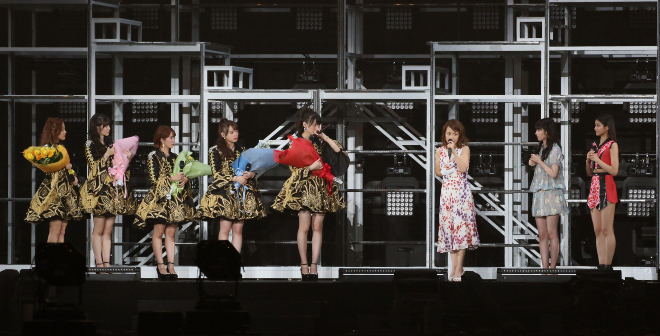 Today on June 12th at 6pm JST, ℃-ute held their final performance at Saitama Super Arena. There, they performed for three hours and 10 minutes, finally closing the set at 9:10pm, where they took their final bows and waved goodbye to all of their beloved fans. It was a concert filled with happiness, tears and memories of ℃-ute, and it will be something for us to look back upon fondly when we want to remember the perseverance and delight of ℃-ute, and the amazing group that they became at the end of their journey. It's weird sitting here, writing this article. I don't believe that they've officially disbanded, or that this was their final goodbye. Deep down, I feel like I will still see them in future music videos and on a live stage. Tomorrow, I feel like they will pop up on our feeds and announce a new tour, or bring out a new song. It's still so weird to think that tonight in Japan, this iconic Idol group has taken their final stage, and bade their farewells. There is a part of me that doesn't want to believe it. A lot of people probably feel the same way, because this a group that so many love dearly. I'm sure that, in time, the realisation will dawn on me and I will cry more. I cried a little bit already, after watching the concert, but for so long it just felt like a normal performance, filled with energy and happiness that only ℃-ute can produce. They looked so happy and carefree, it was hard to fathom that this was the last performance they would ever give together. 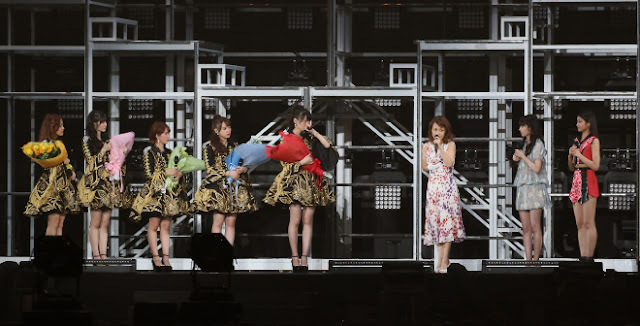 Then, the flowers came along, Nakazawa Yuko, Michishige Sayumi and Wada Ayaka gave their messages to the members and thanked them for their hard work, and the members themselves looked both sad and happy, all at the same time. That was when it dawned on me that this was the end. But even after we watched them receive their flowers, the members still gave each performance their all, ever professional, and ever wonderful, just like always. It feels weird, watching the group you have known forever give the performance of a lifetime because it is their last together. It's weird to know that, tomorrow, they will no longer be there, holding handshake events or selling singles and promoting their group with a smile and charm that wins you over immediately. It's weird to watch them with the understanding that, this is it. This is the true goodbye, and after tonight, they will never stand on this stage as ℃-ute again. Unless there are reunions, or if some members come on-stage during special Hello! Project performances, these five girls will never become the group we know again. They are now simply Yajima Maimi, Nakajima Saki, Suzuki Airi, Okai Chisato, and Hagiwara Mai. Tonight they shined brightly, and even though they cried and expressed their sadness, I saw that ℃-ute were truly happy and content. They performed without regrets, and they gave this final performance their all. Today, I saw five girls standing on a stage that was entirely theirs, and I saw just how mature and confident this group has become after so many years of fighting. They truly shined, and they gave this final performance their all before they let the last song run its course. Through all their tears, ℃-ute smiled, and they showed us their best. Everyone, from the crowds cheering in the stadium to everyone on facebook, twitter and any other site around the world, was calling out to them and lending their support. From the bottom of our hearts, we cheered for ℃-ute and sang along to the songs. Never once did we falter in our love and adoration for them, and until the very end, we watched over these girls and gave them our unrelenting support. Tonight we all joined together as Team ℃-ute and showed them just how much they are loved and adored not only in Japan, but all around the world. As fans, we truly came together this tearful, memorable evening. Let's never forget this wonderful group, and as fans, I know that we will keep the memory and joy of ℃-ute alive through their music. Tonight was the end of something great, but for 15 years, I thank ℃-ute for providing us with more than music and entertainment. To us, they are more than Idols and performers. They are an inspiration, a lifeline, and a reason to move forward. For so many people, this group is their world, and for so long they have been guiding us along and showing us the happiness that they can provide. For all the love, time and effort they have put in, ℃-ute have my deepest thanks, and I am so glad to say that I have been able to watch them become who they are, after coming into this world eight years ago. ℃-ute, it was a pleasure to meet you, both via the internet and in life! Through you, I was able to find even more Idols, and fall in love with even more groups, and though my interest in you has been rocky at best, I am so grateful that you were one of the groups to bring me into the world of Idols, and the first Idol group that I was able to meet. From now and here on after, I will miss you so much. Thank you, for all you have done. Goodbye, Yajima Maimi, Nakajima Saki, Suzuki Airi, Okai Chisato, and Hagiwara Mai. You will always be Team ℃-ute in our hearts. The Final Appreciation Post - Goodbye, ℃-ute.